There are occasions when you need to order an item that you wish to add to your stock list, but which you currently do not wish to keep in stock. mSupply® treats such an item as a Non-stock item. Although you do not hold any stock of a non-stock item, it is quite likely that you may place regular orders for it. 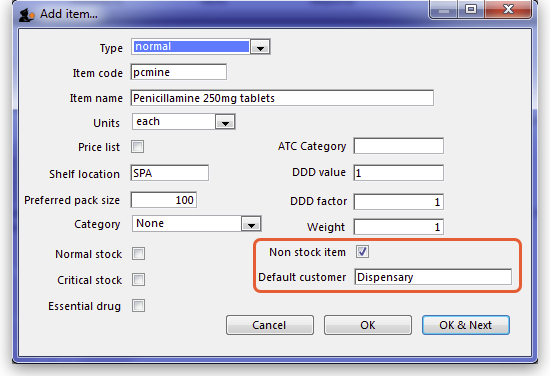 The example used here to demonstrate this is for non-stock item Penicillamine 250mg tablets. From the Item menu, select New item, and enter the particulars as you normally do, only this time check the Non-stock item box. In the box immediately below, select the customer from the list of customers held in mSupply®. To place an order for a non-stock item, a customer must be identified, and this customer becomes the default customer for the item. Should you need to order the same item for a different customer at a later date, the new customer is entered at the time the Purchase Order is being created. On receiving the order, proceed as usual to the New Goods receipt form. In our example, we have ordered 2 items from IDA, one of which is our non-stock item, Penicillamine 250mg tablets, and it appears in blue. 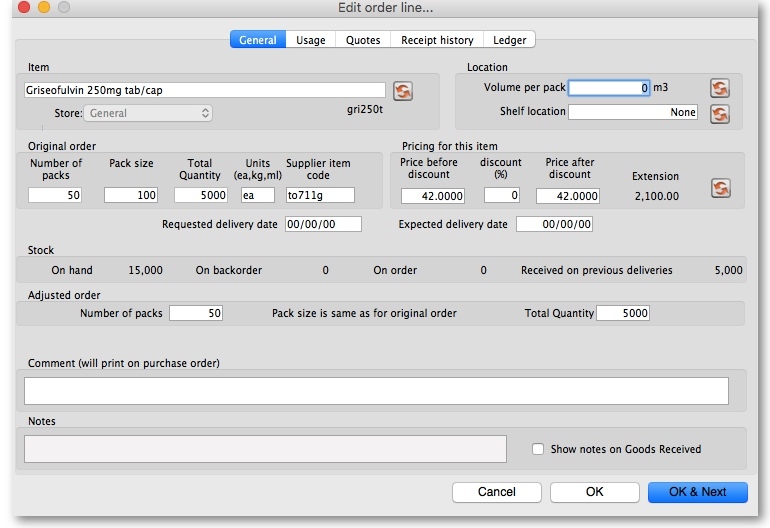 advising you that 'Customer invoices have been created for non stock items……': From the main menu, choosing Customer > Show invoices allows us to select and process the invoice which has been created automatically for the non stock item for our customer, the Dispensary.